The global down and feather market is expected to reach a value of US$ 8,236.0 Mn by 2026. The market is projected to expand at a CAGR of 7.0% in terms of value during the forecast period from 2018 to 2026, according to a new research report by Transparency Market Research (TMR). Down and feather are the by-products obtained from slaughtering of duck and goose for consumption. The growth in consumption of duck and goose has led tothe availability of down and feather across the globe. These by-products are processed to meet the demand from various end users. The primary processing of down and feather may vary based on the application of the end product. Based on origin, the duck segment is anticipated to expand at a CAGR of 7.2% during the forecast period from 2018 to 2026. 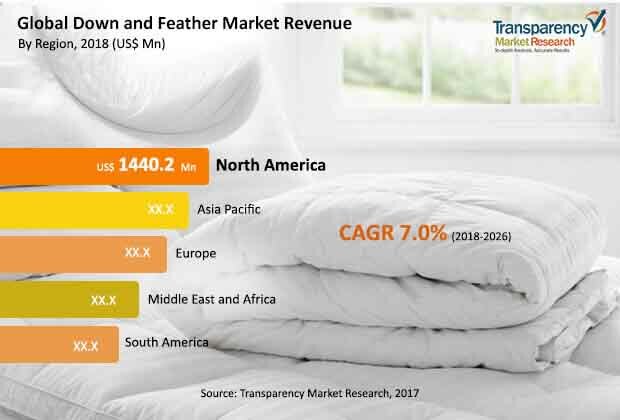 Factors such as growth in consumer preference for natural products, availability of end products at lower price, and rising demand for furnishing products from the residential and commercial sector are driving the growth of the down and feather market. However, increase in poultry diseases such as H5N8 bird flu virus, H5N9 avian flu, duck plague, aflatoxicosis, parasitic diseases, and goose parvovirus, and stringent laws and regulations while obtaining down and feather from poultry birds are major restraints for the down and feather market. Investing in the online distribution channel, reusing of down and feather by recycling to meet consumer demand, and modification of down and feather in primary processing as per requirement of end use application are the opportunities in the market. Nevertheless, it also faces threats from regulatory bodies implementing stringent laws and regulation in terms of quality aspects. Additionally, growth in innovation and technology related to synthetic products as a substitute for down and feather would hamper the business. The global down and feather market report offers detailed segmentation based on origin, product type, distribution channel, and region. According to the report, based on origin, the duck segment is anticipated to expand ata CAGR of 7.2% during the forecast period from 2018 to 2026 owing to high consumption of duck across the globe. The most commonly used products by end-users in the global market are bedding, comforters, pillows, and apparel. Comforters was the largest segment of the down and feather market in terms of value in 2017. However, the global down and feather market based on product type is expected to be attractive for pillows and apparel. In terms of value, pillows and apparel is forecasted to expand at a CAGR of 7.2% and 7.1% respectively during the forecast period from 2018 to 2026. The global down and feather market based on distribution channel is expected to be attractive for the online channel with a CAGR of 7.5% in terms of revenue during the forecast period from 2018 to 2026. The offline distribution channel is forecasted to be dominated by specialty stores at a CAGR of 6.9% in terms of revenue. North America led the down and feather market in 2017. However, the market in Asia Pacific is anticipated to expandat a CAGR of 7.5 % during the forecast period from 2018 to 2026. The primary drivers of the down and feather market in Asia Pacific are a preference for use of natural products, growth in population, and availability of products at lower prices. Additionally, increasing demand from the residential and commercial segment for furnishing is stimulating the down and feather market. North America is expected to witness substantial growth rate during the forecast period. The market in Europe, with a major potential for down and feather is anticipated to rise at a CAGR of 7.0% in terms of value during the forecast period from 2018 to 2026. The leading players operating in the market, manufacturing a wide range of down and feather products include Allied Feather & Down, Bettfedern Handelsgesellschaft mbH & Co. KG (Rohdex), United Feather & Down, Inc, Norfolk Feather Company, Down-Lite International, Inc., Hans Kruchen, Heinrich Häussling GmbH & Co., Feather Industries, KL Down, and Maya Tekstil profiled in this report.